Are you ready to let go of fear and doubt? Are you ready to start finding more balance and happiness in life? 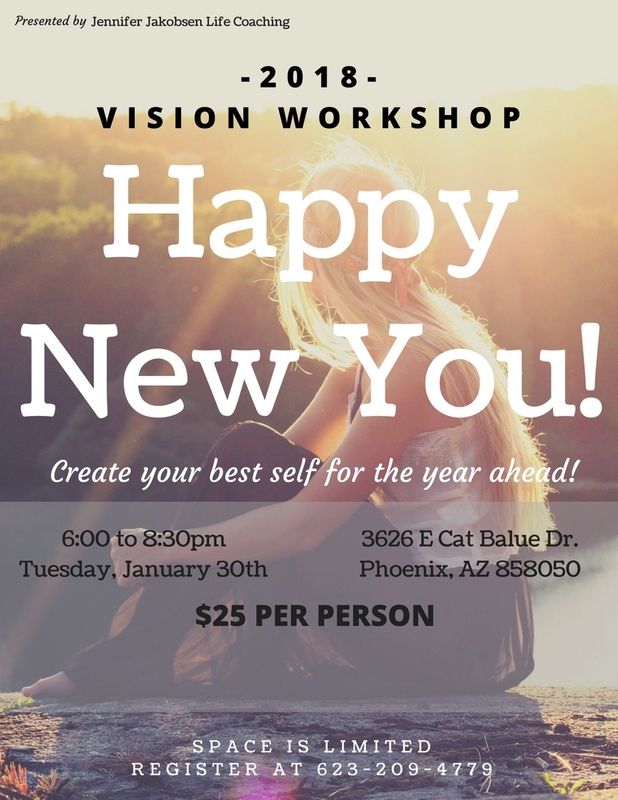 Are you ready to discover your best self with a vision and a plan for the year ahead? This can be your best year yet! The "Happy New You!" workshop will help you accomplish this in a supportive atmosphere full of others who want the same thing you do. Register before 1/25 and receive a free coaching session with Jennifer. Bring a friend and receive $5 off registration. Cost is $25 and is a tax write-off for your business. Space is limited so reserve your seat today. For more information contact Jennifer at 623-209-4779. Feeling stuck in your life? Too many demands on your precious time? Feeling more connected to your iPhone than your loved ones? This workshop will focus on four simple tips to be successful in your relationships with life, love and work. Join my FREE seminar today to discover a new you!